A part of this two day trek leads across the Ouirgane National Park. Ouirgane area is significant with red color, its slopes are covered with juniper trees and dotted with traditional flat – roofed houses made of stone. One of the villages has a big hamam (steam bath), which can be visited as a part of the trekking route. The big waterfall is one of the highlights of this hike. This trek offers a chance to experience a Berber way of living, eat local tajine and enjoy the tranquility of the mountains. 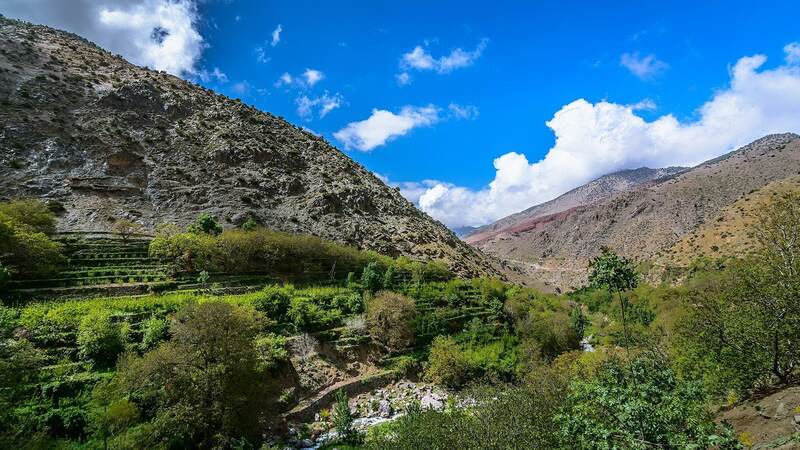 After breakfast in Marrakech, pick up & drive towards the high Atlas Mountains via Tahnnaout, Oued Ghighaya & Asni, enjoy the stunning view of the villages along the valley. Arrival to Imlil (65km from Marrakech), meet the trekking crew (guide & muleteers) have a cup of mint tea for the welcoming. Then start the trek towards Azzaden valley via Tizi Mzik pass (2684m), spectacular view over Imlil valley including several nighbouring high Atlas Peaks, Lunch will be served right at the top of the pass, after lunch a downhill walk to the Azzaden valley through juniper forest to get to Tizi Oussem village. Overnight at the Berber gite. 6 hrs walking.